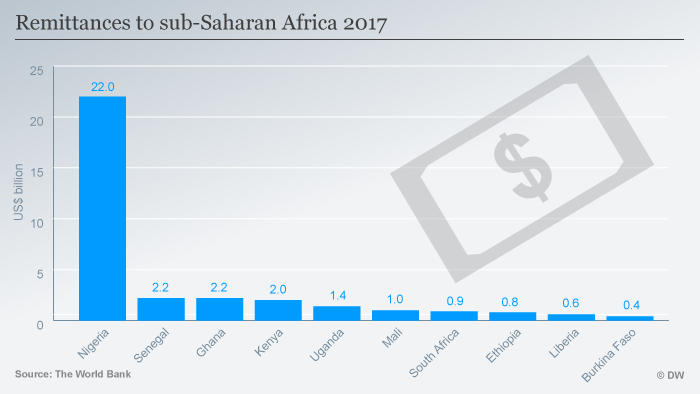 Billions of dollars in remittances flowed to Africa in 2017. 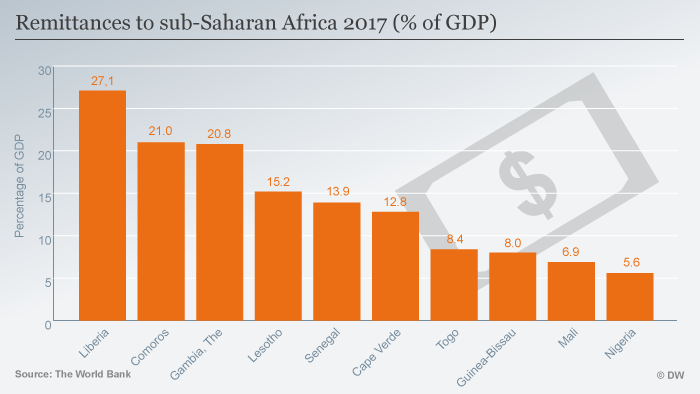 The money could go further if it wasn’t more expensive to send money to Africa than anywhere else in the world, a new World Bank study finds. Immigrants sent a $38 billion (€31.1 billion) back home to Africa in 2017, according to a new World Bank briefing paper. Nigeria accounts for the lion’s share of this with $21.9 billion, followed by Senegal with $2.2 billion and Ghana with $2.2 billion. Although the total amount of remittances sent worldwide hit record levels last year, the World Bank found this wasn’t the case in Africa. However, more money was sent to the continent in 2017 than in 2016 when migrants remitted $34 billion. The real sums sent to Africa are assumed to be much higher. Not only is official data unreliable (or, at times, unavailable), remittances often flow through informal channels carried by trusted friends or bus drivers across borders instead of Western Union and MoneyGram. Remittances have now become one of the most important external sources of finance for Africa. “Remittances are a lifeblood,” said Nikki Kettles from Finmark Trust, a South African-based organization working to make financial services more accessible to the poor. She said it was families, especially to women and children, who benefited from remittances in southern Africa where her organization worked. “People working in South Africa send money home, for example, to Zimbabwe, DR Congo and Malawi. People are using [the payments] to feed or educate, not for other reasons,” she said. Numerous studies have found that remittances directly benefit the welfare of those receiving the money. In poorer regions and countries, such payments can often buffer the vagaries of poverty or instability by covering basic necessities such as food, school fees, rent and health care. Remittances are also often used to start a business, build a house or buy a vehicle.